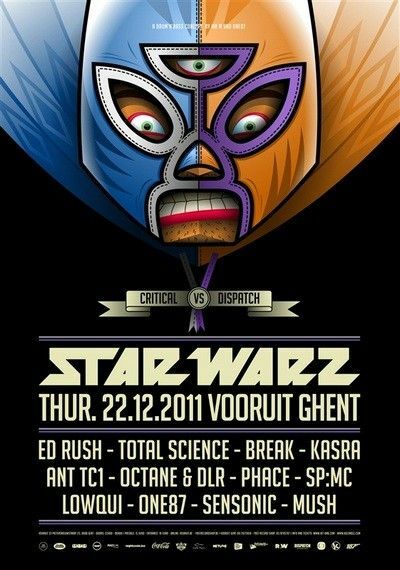 You may have heard the news that Star Warz will be joining forces with Daily Dubstep on New Years Eve. However, before we get to that, we would like to invite all those who are up for the more serious side of Drum ‘n’ Bass to join us on this upcoming edition on 22/12/11 ! Star Warz is known for its top quality line ups, great artwork, a top class venue and a heavyweight sound-system and that won’t be different this time around. Star Warz has had the pleasure of hosting a lot of the world’s leading Drum ‘n’ Bass labels as Metalheadz, Shogun Audio, Renegade Hardware, Soul:R, 31 Records, Commercial Suicide, Exit and many more. This time expect a clash between two other major players in the Drum ‘n’ Bass scene today, namely Kasra’s Critical Music imprint and Ant TC1’s Dispatch Recordings. Critical Music was conceived back in 2002 in a front room in north London and has grown from a simple idea driven to put out the best music the scene has to offer; to one of the most well respected underground dance music labels in the UK. Nurturing new talent and releasing some of the freshest breaks and beats from the likes of Break, Rockwell, Breakage, Cyantific, Marcus Intalex, S.P.Y, Calibre, Total Science and many more, even our very own resident ‘One87’, it has gone on to build a loyal following around the world driven on by Kasra’s never ending quest to release quality underground bass music. All artists have been releasing on either one or both of the labels, next to many other leading imprints in the business as well as their own outlets. With Ed Rush, we obviously think of his Virus label while Total Science also produce for labels as Metalheadz, 31 Records, True Playaz, Soul:R and many others while running their own C.I.A. and Advanced labels. Break has strong ties with DNAAudio but also launched his own Symmetry Records in 2006. Octane & DLR are to be found on labels as Renegade Hardware and Peer Pressure while the German Phace is to be found on about all the labels mentioned above and conceived his long awaited Neosignal imprint in 2008. Add to those resident One87 who’s teaming up with MC Mush and local talent Sensonic and not to forget the MC’s on duty : SP:MC and LowQui for yet another unforgettable edition of Star Warz.